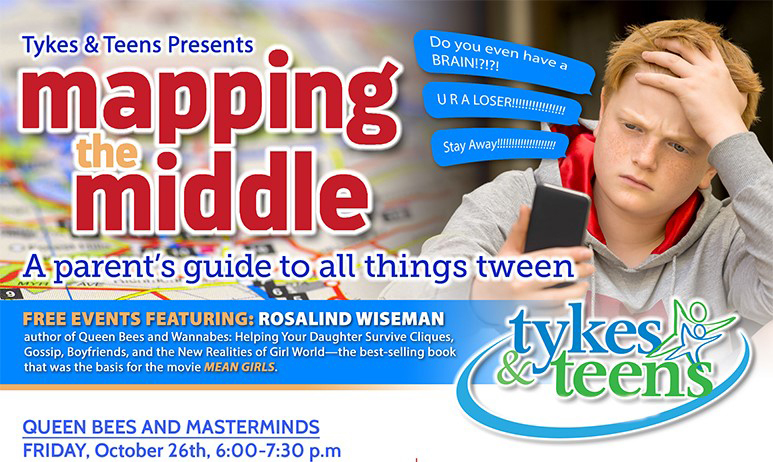 Stuart, FL, October 11, 2018-Tykes & Teens will host a free community event titled "Mapping the Middle-A Guide to All Things Tween" to be held at the IRSC Chastain Campus in Stuart on October 26th & 27th. The event features New York Times best-selling author Rosalind Wiseman, whose book "Queen Bees and Wannabes: Helping Your Daughter Survive Cliques, Gossip, Boyfriends, and the New Realities of Girl World" was the basis for the movie "Mean Girls". 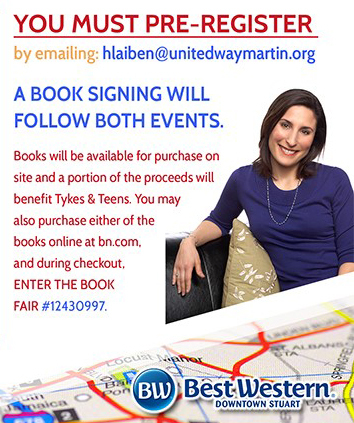 Wiseman’s books will be available to purchase on site and a book signing will follow both events. The event features two presentations that will explore the ways in which tweens’ social group dynamics influence their interactions, and will include suggestions for dealing with video games, social media, and communication breakdowns. Wiseman will also discuss how we can create communities where children can thrive and survive friendships, social media use, gossip, drama, bullying, and the constant pressure to keep up. The event on Friday, October 26th will be held from 6:00 p.m.-7:30 p.m. and is designed for parents, with tweens welcome to attend along with them. Titled “Queen Bees and Masterminds”, this presentation will address the changing social dynamics facing both boys and girls. 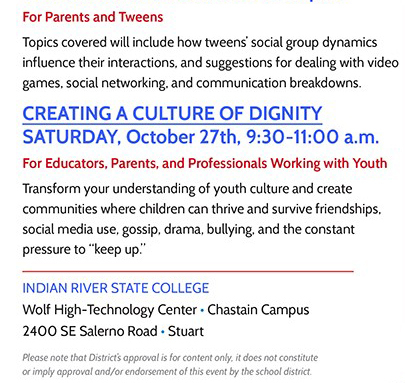 The event on Saturday, October 27th takes place from 9:30 a.m.-11:00 a.m. and is designed for teachers, school administrators, social workers, and others who work with youth. Titled “Creating a Culture of Dignity”, this presentation will focus on creating communities where children can successfully manage the changing landscape of social pressures. The events are hosted by nonprofit children’s mental health agency Tykes & Teens and sponsored by The Martin County Board of County Commissioners, CHARACTER COUNTS-a program of the United Way of Martin County, Martin Health System, The Children’s Services Council of Martin County, C.O.R.E., Barnes & Noble, and Best Western of Downtown Stuart. Both presentations are free, but you must pre-register by emailing hlaiben@unitedwaymartin.org. For more information, call 772-210-0141. *Media interviews with guest presenter and New York Times Bestselling Author Rosalind Wiseman can be arranged upon request.